The BBC’s iPlayer video on demand service is now available on satellite broadcaster BSkyB’s Sky+, bringing the best of the BBC’s TV programmes directly to the living room. Up to 6.7 million homes with a Sky+HD box and broadband connection will be able to enjoy the best of the BBC on demand in a familiar, easy to use BBC iPlayer experience that helps audiences catch up on programmes they have missed. Audiences can access BBC iPlayer directly from Sky’s on demand programme guide, and choose from many of the BBC’s most popular shows, including Doctor Who, Strictly Come Dancing and EastEnders. 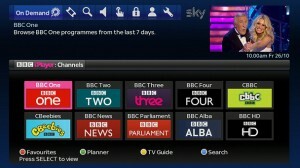 BBC iPlayer joins catch-up TV from Sky, ITV, Channel 5 on the platform, with Channel 4’s 4oD due to be added early in 2013, completing the line-up of free-to-air terrestrial catch-up TV services on Sky+. Sky On Demand also offers on demand access to shows from a number of other leading channels including UKTV, MTV and Discovery, in addition to movies on demand and drama ‘box-sets’ such as Boardwalk Empire, Mad Men and Stella. BBC iPlayer has been integrated into Sky’s existing electronic programme guide and on demand menus. It contains a number of features designed to make it easier for Sky customers to find the BBC programmes they want, with content separated into a series of simple categories. Once a customer has made their choice, the programme is downloaded directly to their Sky+ planner for them to watch at a time that suits them. The deal between the BBC and Sky builds on a substantial history of industry partnerships for BBC iPlayer, which is now available on over 650 platforms and devices. By launching on Sky+, BBC iPlayer is now available on every major UK television platform, at no extra charge. Luke Bradley-Jones, Director of TV Products, Sky, said that providing customers with the flexibility to enjoy their favourite TV on demand, Sky’s “comprehensive” catch-up TV service perfectly complemented the “genius” of Sky+, which already helped millions of our customers take charge of their viewing. “We continue to put Sky customers in control, with the addition of BBC iPlayer to Sky+ sitting alongside a range of innovations including remote record, series link and now even being able to use your iPad as a remote control,” he added. Daniel Danker, General Manager, BBC Programmes and On-Demand, noted that 20 per cent of all iPlayer use was already on the living room TV. “By partnering with Sky, BBC iPlayer is available on all major UK TV platforms at no extra charge, making sure our audiences can access the best of the BBC’s content at home and on the go, whenever and wherever they choose,” he advised. To enjoy Catch Up, Sky customers simply need to activate their On Demand service and connect their Sky+HD box to their broadband router.